Sometimes you wake up in LA and the city suffocates you. Beyond the smog, we’re a city of passionate people, folks trying to make it in about every dark niche of every form of entertainment one can imagine. And when you’re trying to make it with your art, you’re selling yourself to live. So sometimes, when you wake up in LA, the pressure of it all can snuff out your candle. 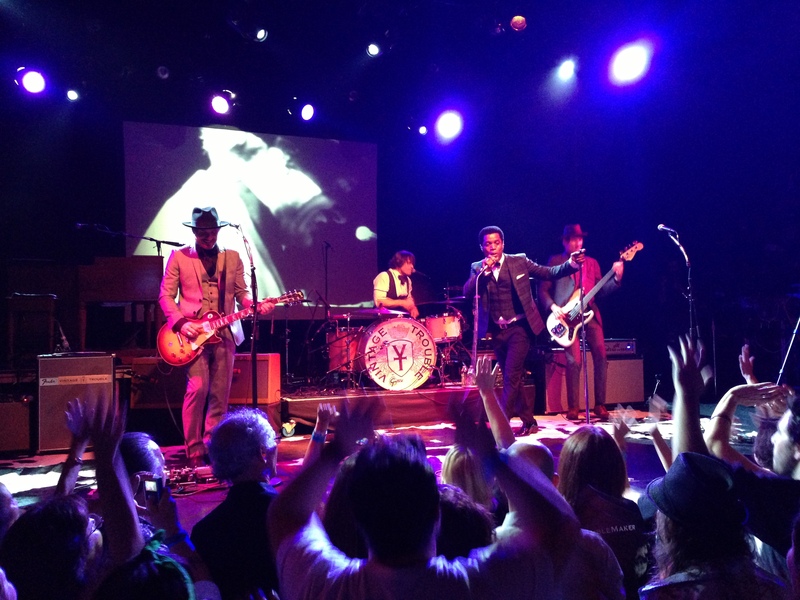 The El Rey is my favorite venue in LA, and once inside I relished the fact that the girls were wearing dresses and had their hair done, that there were guys in suits and bow ties. There were young and old, gaggles of girls, couples on dates, and singletons. Drinks in hands and dancin’ shoes on, these old souls…these Troublemakers….had gathered here today to welcome home LA’s most recent success story. 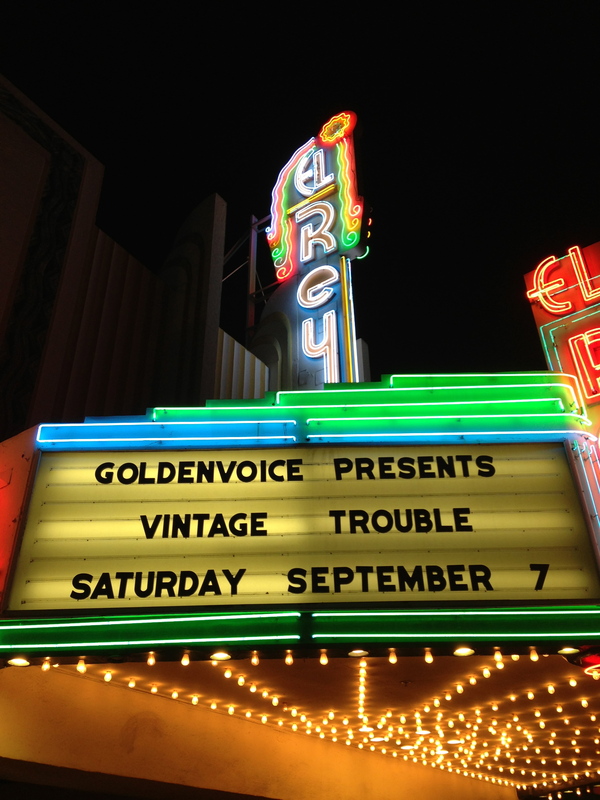 When I heard the name Vintage Trouble for the first time, the mood it evoked kinda stuck with me. This was about a year ago, and I was surprised I hadn’t heard of this band that was given a prestigious spot opening for The Who. I looked them up, took a listen, took a watch…and was intrigued. In all honesty, their record The Bomb Shelter Sessions didn’t blow me away. The songs sounded a little too derivative, were somewhat forgettable, and the production seemed too slick for what they were going for. But I dug their vibe, and word on the street was that the magic with this band was seeing them live. Since that’s my thing anyway, VT went on my list of bands I must see, and months and months later, I found myself standing in the El Rey, wearing a dress and ready to dance. The red curtains parted, and standing there were 4 dapper dudes gathered around the drum kit. They shook each others’ hands in a faux formal greeting, assumed their positions, and launched into “Low Down Dirty Dog”. And for the next two hours, they did not break character once. I mean that in every minute detail of the set: it was a timeless performance, where nothing existed in the world but all of us in that room. There were no keys hanging from belts, no Aquafina bottles being swigged on stage, no unfocused, bored glances to take you out of the show and into the real world. Every aspect was carefully curated, every second mattered. One song in, and I realized I was surrounded by fans who had been there since the beginning, who knew every word and when to clap, and saw the band when they began just a few years ago, playing speakeasies and such around LA. The band had a very defined idea of who they wanted to be, bringing back something old and making it new again. They quickly found their audience and the rest, as they say, is history. Vocalist Ty Taylor evokes the spirit of James Brown, spinning around and wielding the mic cord like a lasso. He brings the funk as well as he brings the soul, and, throughout the night, it seemed as though he were moved to tears as he spoke often of how blessed this band is. It was heartwarming to see a band realize and be so thankful that they would not be standing on stage in front of a sold out El Rey if it weren’t for their fans. It’s rare to see an entire band that has charisma, and seem to be completely inside the set and on the same vibe. Beyond Taylor’s enigmatic skills as a frontman, Nalle Colt’s smokey, bluesy guitar enthralled, and the funky rhythm section of Rick Barrio Dill on bass and Richard Danielson on drums anchored the set in hip-swingin’ fury. Some of Taylor’s interludes were reverend-esque; I almost wanted to say “Amen” after he would introduce a song. For a few songs he would jump down into the crowd, dancing with the ladies, and at one point even going up to the VIP balcony. Being someone new to all of this, I felt he helped me understand the band’s intentions, and even their short but storied history. While the hip-shakin’, juke joint inspired songs are fun, “Run Outta You” was one of the songs of the night where I felt strongly that I was witnessing something really special. Where that little voice in the back of my head kept going, “wow…this is amazing….this is unbelievable.” The feeling of authenticity and passion they exude, beyond the voice, the chords, the beats, but even into the facial expressions in between the notes, where the band seems to be just vibing off of the moment and each other…that’s where I could tell that this was a special night. 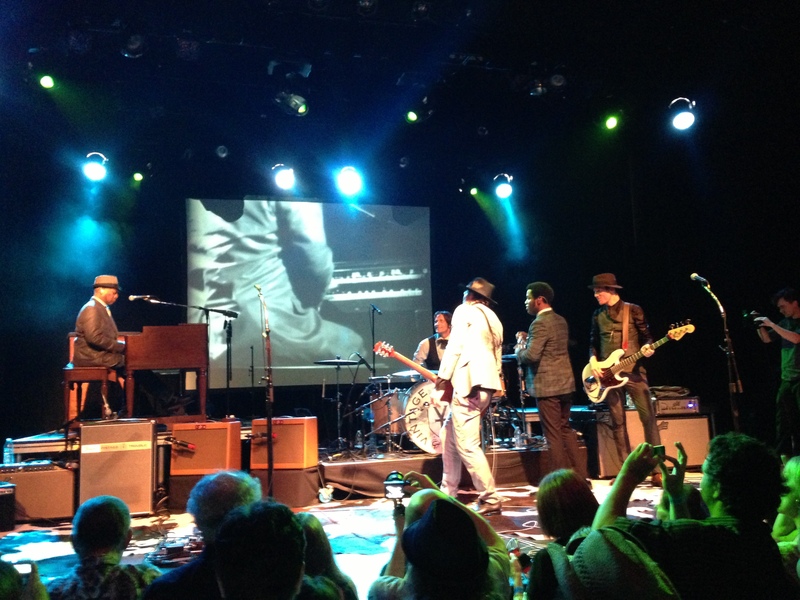 A highlight of the set was when they were joined by one of their idols, Booker T. Jones, of Booker T. & the M.G.s of Stax fame. When he sat down at the piano and started playing “Green Onions”, my friend visiting from Nashville and I both kinda lost it. He played along with the band for “Nancy Lee”, “Not Alright By Me”, and “Back to the Country”. I spend the majority of my time with hard rock and metal bands, but when I say that this band is on fire, I mean it in a different way. They’ve resurrected and re-imagined something, and it is speaking to us. 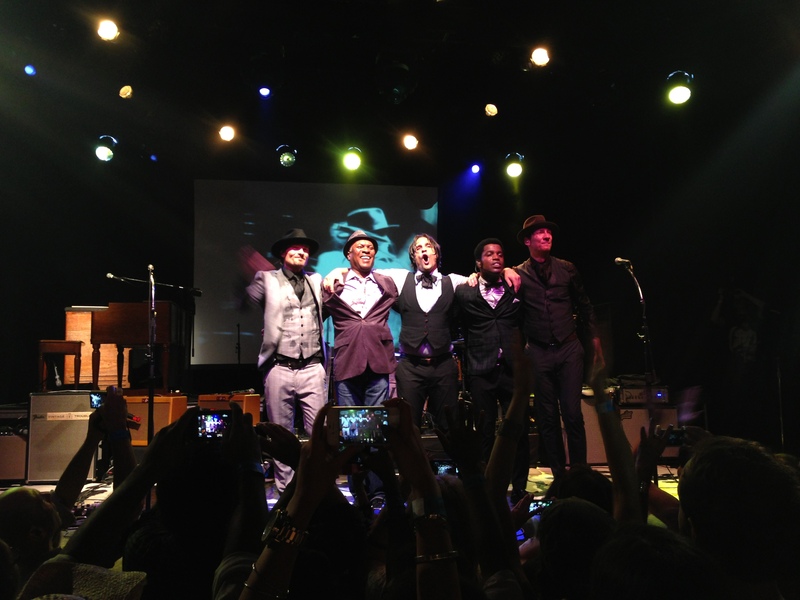 As Booker T. rejoined them for the final song, a cover of the Joe Cocker version of “With a Little Help From My Friends”, you could hear people in the room gasp at it’s commencement. You just knew what this band would bring to that song. Sweating through their suits with smiles on their faces, the mood of that song, the mood of the night, put us over the top to end the show. At the set’s culmination, the band announced they would be at the merch table to meet everyone. They took a bow, jumped off the front of the stage, and walked straight through the crowd to spend who knows how long talking to their fans. And that was the night that I became a Troublemaker. I am in tears!!! This was such an awesome well written and very accurate review!!!!! Your reference to seeing them live, and how their fans know the words to their songs…and when to clap..
And you noticed what great guys they are…truly thankful for their fans and success..
Well written indeed, you ‘got it’ all the atmosphere of VT. Thank you for a perfect piece on my favorite band. Physical universe purely from the music and the love. It was incredible. So Thank you. supportive international Group of fans….I’ve never seen anything like it. And will change the world… Because we say so and anything is possible.